Be transported to the Peruvian Rainforest on this Sustainable Journey. Life is pretty good when you wake up in a comfortable bed, fully refreshed and ready for the day. Then again, life is extra good when waking up to hear the lyrical sounds of birds, munching peccaries, howler monkeys and other amazing creatures across a rainforest canopy. In other words, one gets a new an appreciation of color when the surrounding hues are reflected in the rocks and a new appreciation of life when waking up with the rainforest of Peru. A recent photography safari through Tambopata National Reserve in Peru marked my second visit to the Amazon and third visit to a rainforest ecosystem. I must admit I love more each time I witness an ephemeral animal sighting or gain a greater understanding of the sometimes harsh, and other times remarkable, mysteries of the rainforest. 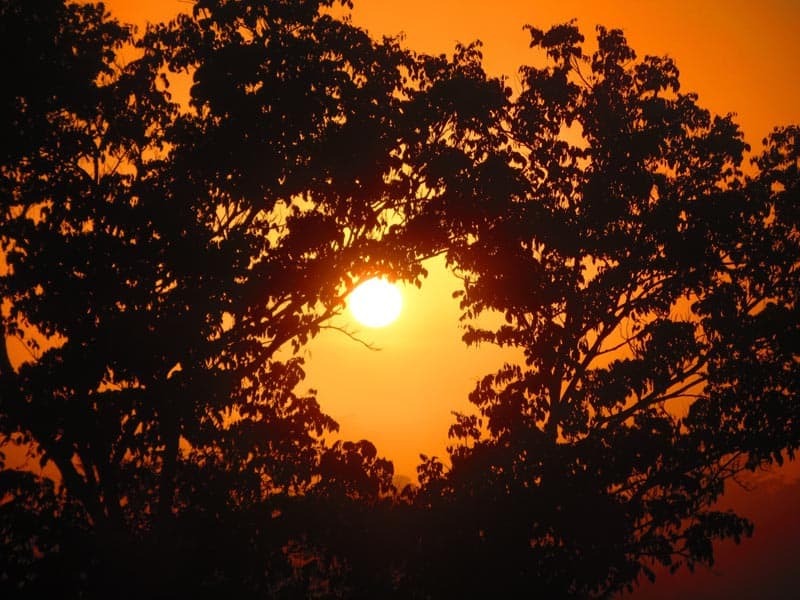 Upon arriving at Puerto Maldonado, I was greeted with the familiar warm, dirt scented and humid air that demarcates the Amazon from other ecosystems. I was excited at the prospect of the more scientific safari I was about to embark on in this relatively undiscovered part of the Amazon. From the main lodge, there are four above-ground bridges that extend to the individual rooms. 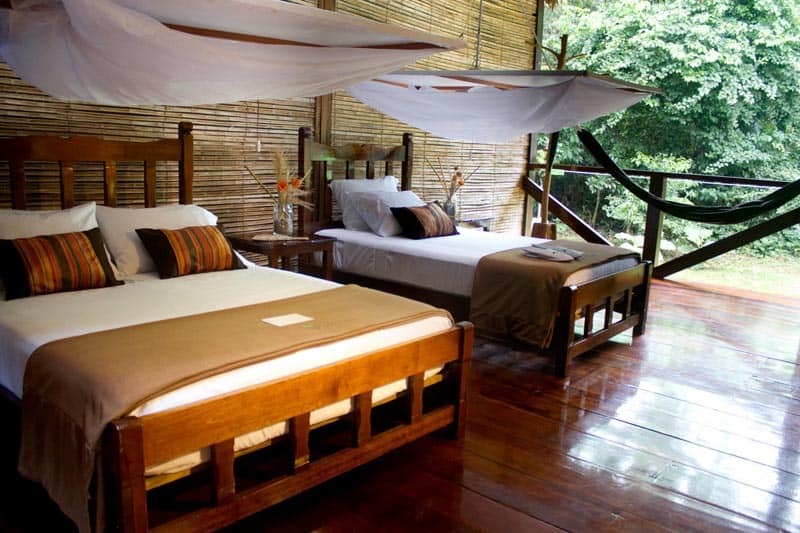 The standard rooms offer open-air rainforest views, full private bathrooms, hammocks, sitting areas furnished by local artisans, and very comfortable beds (with mosquito netting). Superior rooms offer electricity and free WiFi. • naturalist-led kayaking, hiking and mountain biking adventures. As lovely as the sustainable lodge and surroundings were, it was the wildlife that rendered this trip most memorable for me. The capybara's strong paws up close (through the professional camera), the great black hawk amused by something in the water. The Cormorant figuring out its next move and the grand looking Orinoco Geese. 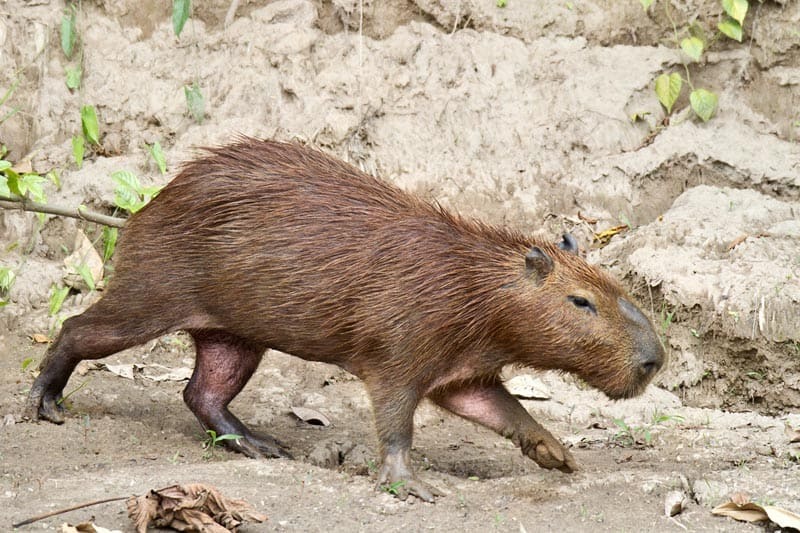 I loved spying the peccaries looking for grub or getting up close with the smiling caiman. And I'll never forget the little frog who patiently posed for his perfect shot, or the “24-caret” gold-colored frog who curiously looked into the camera before leaping away. Wildlife is abundant in the Peruvian Amazon and Pedro, Jeff and Phil were eager to share their passions, knowledge and experiences. But, for all the photo opportunities that were near and around Refugio Amazonas, the science was centered at another remote lodge, the Tambopata Research Center (TRC). The 18-room TRC, which is run as part lodge / part macaw conservation center, has been supporting research in this pristine part of Tambopata National Reserve / Bahajua-Sonene National Park for the last 20 years. TRC lodge sometimes sponsors local Peruvian scientists, but during our stay, I had a chance to talk with international macaw biologists and ecologists as well as graduate students from Texas A&M University (a sponsor of TRC) who were visiting TRC for their fieldwork. There was exciting research all around, however our fieldwork was at hand. Two experiments were top of mind for Jeff and Phil. First, they endeavored to capture video footage of jaguars with the use of weatherized sensors, flashes and cameras. They had thought through the idea for months and great care was taken to set up the expensive equipment in a “high traffic” area. For eighteen hours, we anxiously awaited overnight back at TRC. Would we see an ocelot, puma, or even a jaguar? Unfortunately, no one had noticed the numerous leaf-cutter anthills that were about 20 feet away from the cameras! Little did we know that during those eighteen hours, there was a fiesta of leaf-cutter ants chewing through anything and everything that was plastic or rubber on or around the equipment. While Jeff was thinking about his camera insurance coverage, we needed to press on to the second experiment. 2.To determine the effectiveness of Calvin Klein's Obsession for Men in attracting wild animals, specifically jaguars, in the Peruvian Amazon. Back in 2010, the Wildlife Conservation Society (WCS) determined that this scent above all others was most effective in attracting certain species in and around the Maya temples of Guatemala. But would it work for Peru? Over the course of a month, an outdoor camera was placed in full view of two socks – one carrying the Calvin Klein scent and the other “control” sock with no scent. After collecting and reviewing the month's video, it showed that while many wild animals had passed (peccaries, jaguars, etc.) none bothered to even notice the scent. So, two experiments gone awry, but such is the nature of science. For me, a person who loves nature, the opportunity to combine a rainforest safari with photography and scientific discovery was a penultimate experience that I will treasure for years to come. Irene is the founder of Greenloons – a premier online resource dedicated to inspiring people to think different, be different and travel different – in ways that help to ensure a more sustainable planet. An advocate of social empowerment, financial viability and environmental preservation, Greenloons is the only company that connects mindful travelers with unique, meaningful and eco-certified travel experiences all over the world. Drawing upon her professional and personal experiences to address authentic ecotourism from community, ecological and financial points of view, Irene is a frequent conference speaker, blogger and radio talk show guest. Join the Greenloons community on Facebook. Follow the discussion with Greenloons on Twitter. Be inspired by travel on Pinterest. 21 Responses to "The Colorful Peruvian Rainforest – A Sustainable Photo Journey"
Step1: Locate exactly where leaf cutter ant activity is current if colonies are not clear. In the course of the summer season, the ants are most active at evening in between eleven:00 p.m. and midnight. The first night following a plant is targeted, you will recognize various leaves close to the base of the plant that seem like they just fell off the plant. Some of the leaves will have half-moon shaped cuts out of their side. The second evening the ants will minimize up the leaves and carry them into their den. That is when you will need to take your flashlight and comply with the trail of ants to their den, and find the openings or “vents” in which they are entering the ground. Great wildlife photos, Irene! I love how detailed they are. The room looks cozy. I love the shot of the frog and also the colorful orange hue of the sunset. An astonishing view surrounded by colorful animal creatures means PERFECT VACATION. Thanks Kristy and I totally agree that the elements of sustainability, pristine nature, and wildlife make for the perfect vacation! What an incredibly diverse part of the world. I yearn to visit the rainforest, wonderful images and super informative post! Much appreciated Charli! I’m so glad that you found the article helpful as there are many awesome eco-lodges around the world that promote social empowerment, environmental responsibility, and economic benefits to local communities. I hope, like you, more readers are inspired to travel green! Stunning photos! Especially love the Smiling Caiman and the Gold Colored Curious Frog ; such detail! Love the sustainable aspects of the lodge– sounds like a great place to stay. Thanks Debbie! I must credit the professional equipment that I was able to use during the photo safari as it made a HUGE difference! Also, the lodge had that wonderful balance between sustainability and comfort, which can be tough to find in certain regions – especially the rainforest. Great photos of the animals! Great detail and colors on the frog photo. Thanks Jeremy! 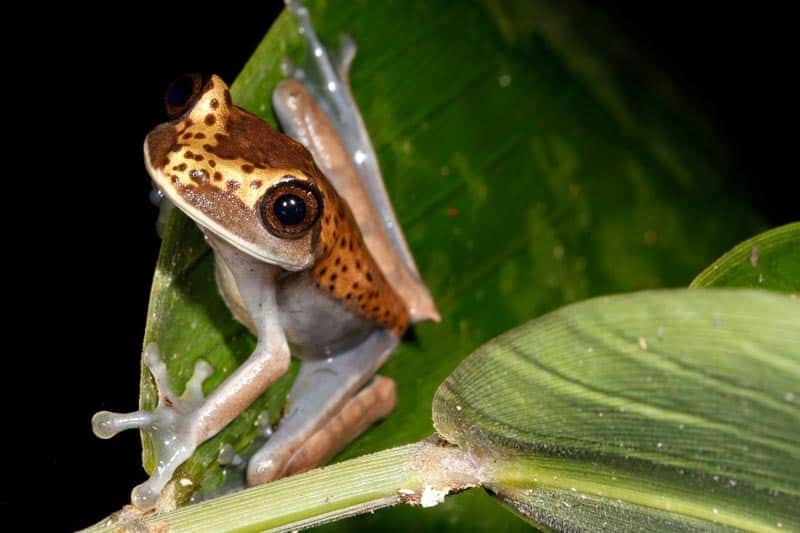 At first, Jeff, Phil and Pedro could not recognize the frog species and thought that another had been discovered, but later someone else via social media pointed out that it was a Hypsiboas geographicus juvenile. What a stunning set of photos. 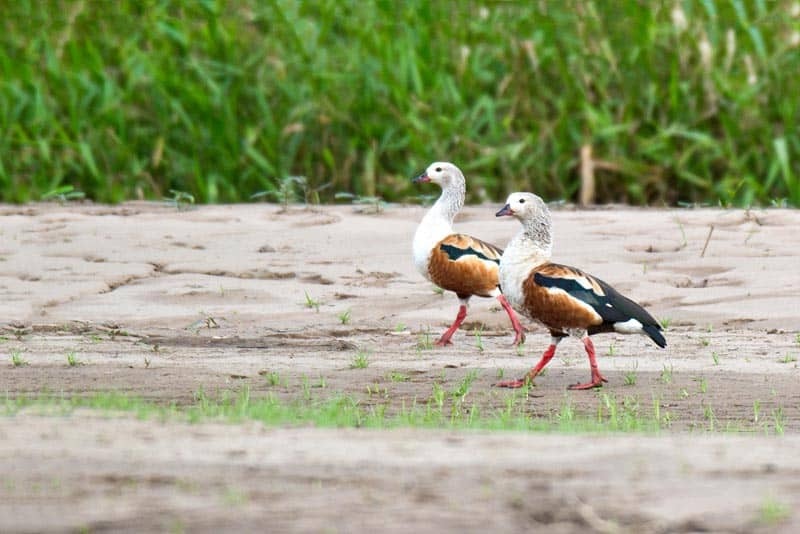 Great to see a region with such diversity – beautiful vista’s, great accommodation, wildlife – it really seems like the Peruvian part of the Amazon rain forest has it all. Thanks for putting this together. Thanks Rob! To think, I had to choose only 6 photos of the many I took. It is truly an amazing place. I love the rainforest and jungle. We had a great time in Costa Rica exploring it. So much to see. It’s best to just stand still and let the rainforest come to life around you. You will hear and see so much happening around you that you miss when you just walk on by. Those leaf cutter ants are incredible. I want to know who’s giving the instructions! I couldn’t agree more Nicole! And, those leaf cutter ants are just amazing. I learned that the ‘workers’ are wingless female ants that never reproduce while the male ant’s only function is to mate with a queen (after which he ‘may die’). A true female-led (and organized) society! I have spent hours watching leaf cutter ants at work. They are fascintating. that is crocodile isn’t it? what do you mean by “caiman”? Hi Julia, Actually I learned a bit about caimans while in Peru. First, they are the smaller/shorter distant cousins of crocodiles. 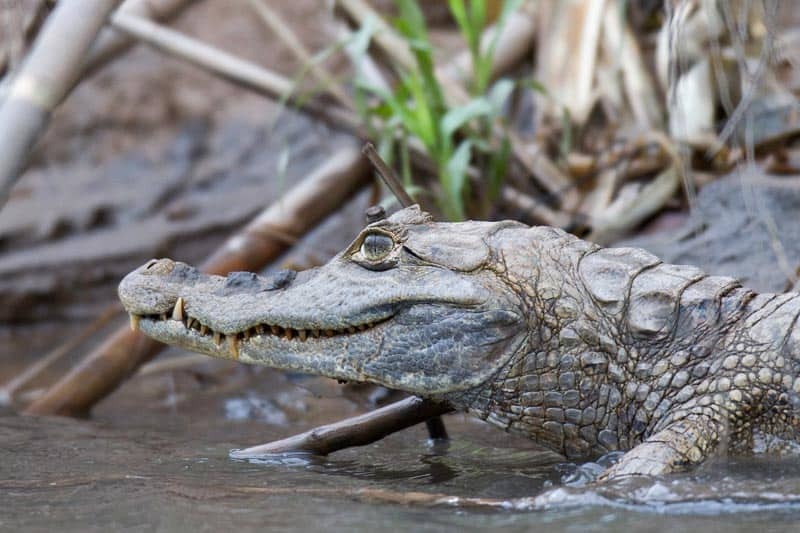 Also, caimans have pointier heads, shorter tails, and have U-shaped noses (crocodiles have V-shaped noses). Very subtle differences indeed. Ha, I didn’t see this reply, thanks Irene. Caiman’s are in the same family as crocodiles/alligators. They are a smaller version found in Central and South America.